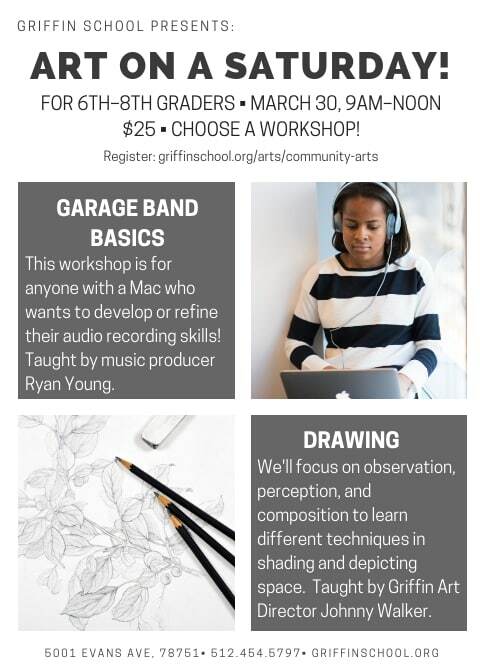 March 30, 9am-noon: Garage Band Basics and Drawing! Garage Band Basics: This workshop is for anyone with a Mac who wants to develop (or refine) their audio recording skills. Whether it’s creating drum loops, recording audio for a podcast, or learning how to make a great demo, this workshop is for you! Students need only their Mac laptops and a set of earbuds/headphones. Taught by Griffin music instructor and local music producer Ryan Young. Drawing: A drawing is a picture or diagram created by making lines on a surface. Human beings have been making drawings for nearly 40,000 years. In this workshop, we’ll be working mainly with black and white media—pencils, pens, ink, charcoal. We’ll learn different techniques in shading and depicting space. Our focus will be on observation, perception, and composition. Taught by Griffin Art Director Johnny Walker.